During their splashy press conference on Monday, Steve Ballmer and the other Microsoft execs referred to the company's upcoming Surface devices as tablets. So it makes sense to compare them to other tablets, right? Actually, that's only half-right. The ARM-based Surface for Windows RT looks like--and will be priced like--competing tablets, but the Surface for Windows Pro will be too heavy and expensive to compete head-to-head with the iPad. (For the sake of simplicity, I'll refer to the two models as "Surface RT" and "Surface Pro" hereafter.) Surface Pro's natural competition: Windows Ultrabooks. The tricky thing is that the Surface Pro is the tablet that many Windows users think they've been waiting for. It's the one that can do anything a desktop can do: It can run the apps we have already (like Adobe Photoshop CS6, and Camera Bits Photo Mechanic), graphics-intensive games (like Diablo), and other tried-and-true Windows software; and it has a serious laptop processor, Intel's Core series, that can power through complicated work. But the Surface Pro's price may not come in at what you'd expect for a tablet. You can buy a new 16GB iPad for $499, but Microsoft has said that the Surface Pro's price will be more comparable to that of an Ultrabook--likely hundreds of dollars more. Granted, that would put the Surface Pro closer in cost to a 64GB iPad ($700), but that price isn't the one that consumers have in their heads for a tablet. Nor is it a price that will generate mass-market tablet sales. Also, at nearly 2 pounds, the Pro will be far heavier than most tablets. Evidently the Surface Pro won't compete with top tablets in display resolution, either. Microsoft has said that the Surface Pro will have a "Full HD" display, meaning a display with a resolution of at least 1920 by 1200 pixels. That would put it on a par with the best Android tablets from Asus and Acer; but because those displays are 0.5 inch smaller, their pixel density should be better. And none of those tablets' resolutions can compare with the Apple iPad's at 2048 by 1536 pixels. 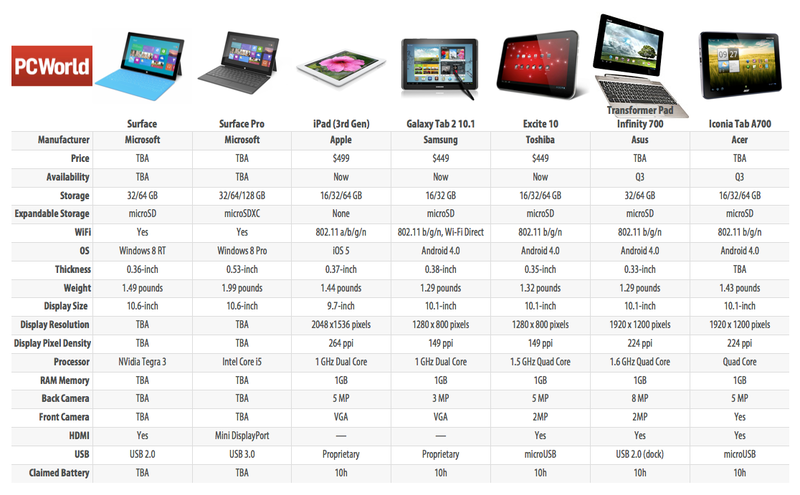 Supposing that the Surface Pro won't match up well against tablets, how will it compare against conventional Ultrabooks? Here's where Microsoft's hardware could show some real advantages. 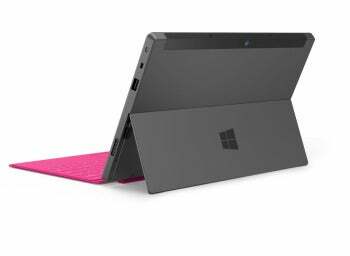 To start with, the Surface Pro would have the advantage of convertibility. It's a tablet when you need it to be one--and when you snap on one of the keyboard covers, it becomes a laptop that can take full advantage of Windows 8 with a touchscreen designed to interact with Metro apps. You'll also get digital ink support: Pen input can be convenient, and this will be part of Surface Pro, though Microsoft hasn't said yet whether the pen will be an included feature of the base-price model or an extra-cost option. At 10.6 inches, the display will be smaller than most Ultrabooks; for many people, however, the flexible design will justify that tradeoff. If the Surface Pro isn't intended to compete directly with the iPad, so be it. But what about the Surface RT? How will it stack up against an iPad or Android tablet? Those tablets, like Surface RT, run lower-power, ARM-based processors. The Surface RT will give you more ports than most competing tablets, along with the ability to view two apps on one screen. The Surface RT tablets will carry at least 32GB of storage (the iPad and many Android tablets start at just 16GB). Though the Surface RT won't have the iPad's high resolution, it will have an optically bonded display, which eliminates the annoying air gap between the screen and the glass for clearer images, improved contrast, and reduced screen glare. Like its more powerful sibling, it will also have a comfortable built-in kickstand. All of those features represent useful improvements on today's tablets. But Microsoft's Surface RT runs into trouble on other metrics. If its weight turns out to be 1.5 pounds (as currently estimated), it will be just 0.06 pound heavier than the current iPad; but iPad itself got heavier this year, not lighter. Android tablets, by contrast, are consistently moving toward lighter weight; for instance, the Surface RT at 1.5 pounds will be about 0.2 pound heavier than the Toshiba Excite 10.1 or the Asus Transformer Prime. Microsoft lists the Surface RT's display as "HD" rather than as "Full HD," which may mean a resolution of just 1366 by 768 pixels—and that won't be competitive with iPad's Retina display, or even with Android tablets like the Asus Transformer Pad 700, announced at CES, and the Acer Iconia Tab A700 (both with resolutions of 1920 by 1200 pixels). There's no question that Microsoft's decision to build its own tablets changes the market considerably. But until we know more-precise details about specs and pricing, accurately predicting how well the two Surface models will compete is quite difficult. In the end, the Surface RT may not quite be an iPad killer. Apps are paramount to tablet buyers, and until we see what kinds of Metro apps Microsoft and its developer partners produce, many consumers may shy away from the Surface RT. Surface Pro, meanwhile, will challenge the current crop of laptops and Ultrabooks--and there it may well win. Why purchase a classic clamshell-style laptop if you can get a tablet that quickly and elegantly becomes a laptop when you need one--all without sacrificing performance, interoperability, or functionality? The big question here is whether consumers can manage with a 10.6-inch display as their laptop screen; for many consumers, I suspect, the convenience of a tablet/laptop hybrid may be worth the drawback of having to put up with a smaller screen. If not, just wait: No doubt Microsoft's hardware partners are kicking plans to design Windows 8 tablets of their own into high gear--including models with bigger screens--to compete with the Surface Pro. Surface RT is packed with productivity potential, and finds a certain measure of success in reinventing the tablet form factor. But its hardware isn't perfect, and its Windows RT operating system lacks flexibility and app support. Delivers legit Microsoft Office support--on a tablet, no less! Redmond has spared no detail in reconsidering what a tablet can, and should, be.